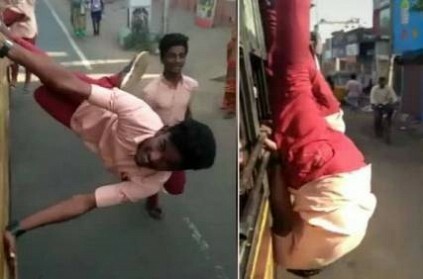 This video is sure to make any parents blood run cold and bring policemen's blood to boil, as school student are seen performing dangerous stunts on the foot board of a bus that has gone viral on social media. Conductors and several passengers, who commute have complained about school students indulging in similar acts regularly but no action has been taken yet. In the video, that has gone viral- it can be clearly seen that the bus is plying on the main road and other vehicles are passing by. Few students who run and board the bus are seen in their uniform. They would be studying approximately in classes 8 to 10. Surprisingly, these student are not just standing on foot board but hanging from the window that too upside down. There are two to three students doing the same stunt while the other friends are hooting his name. Some students are also sitting on top of the bus cheering for their friends. Even after the conductor warned and shouted at them, the students still continue, while the daily commuters are shocked and terrified at their act. This video is viral on social media and has been posted by vijayantony558 on TikTok. Several such incidents have come to light in the recent past in which youngsters have risked their lives but things have not changed despite warning. பலரின் மனம் கவர்ந்த டிக்-டாக் விடைபெறுகிறதா?.. சட்டசபையில் நடந்தது என்ன? ‘டிக் டாக்’தடை செய்யப்பட்டால் முதலில் சந்தோஷப்படுவது நான் தான்..கூறிய தமிழிசை சவுந்தரராஜன்! ‘ரிப்பேருக்கு வந்த போலீஸ் ஜீப்பில் ‘சிங்கம்’ பட பில்டப்’.. டிக்டாக் வீடியோவால் பிடிபட்ட இளைஞர்கள்! ’இனிமே டிக்-டாக்கில் இந்த 100 விஷயங்கள பண்ண முடியாது’..கடுமையான புதிய விதிகள்! போலீஸ் ஸ்டேஷன் முன் டப்ஸ்மாஷ் சேட்டை.. ‘டிக் டாக்’ இளைஞர்களுக்கு வந்த சோதனை! ‘அந்த ஆப்’ யூஸ் பண்றவங்க குற்றவுணர்ச்சி இல்லாத அடிமைகள்! This page contains news relating to various facts and events. The views are generally about current affiars and general topics in diversified areas such as political, international, national, and regional issues, sports, health, travel, lifestyle, technology and business. People having similar interets on the above topics will find this page useful. Tamil Nadu school students perform dangerous stunts on bus | Tamil Nadu News.